It was Saturday night, November 28, 1942. America was one year into World War II. On the home front, Americans were enjoying the Thanksgiving weekend. One thousand people, more than twice the official capacity, were gathered at Boston’s fashionable and popular Coconut Grove night club (which had recently expanded with the addition of the new Broadway Lounge) to celebrate and forget the war for a little while. The Coconut Grove was a place of enchantment. The place was loaded with atmosphere. Its restaurant, bars, and lounges were decorated in a faux tropical style with artificial palm trees made of paper, cloth draperies on the ceilings, flammable furniture, and other decorations. 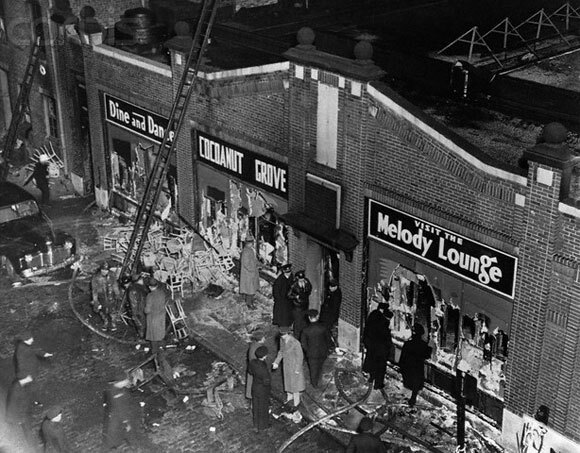 The fire started about 10:15 on Saturday night in the intimate and dimly lit Melody Lounge downstairs. It was believed to have started when a 16-year-old busboy, Stanley Tomaszewski, was attempting to fix a light bulb among the artificial palm trees that a young man had loosened to allow himself darkness in which to kiss his girlfriend. When the busboy attempted to re-screw the bulb, he couldn’t see very well, so he struck a match; he fixed the bulb the way it was supposed to be and blew out the match. Almost immediately patrons saw flames among the palm trees. Waiters attempted to douse the fire with water, but the flames spread too fast. The fire was out of control. Within five minutes, the entire nightclub was engulfed. When people realized what was happening, they panicked. They tried to get out the way they had gone in, through the main entrance. The problem with the main entrance was that it was a revolving door that soon became jammed with bodies of people trying to escape. Firefighters had to dismantle the door to get inside to fight the flames. Other avenues of escape were also useless. Some side exits had been bolted shut because the owners were afraid that some patrons would try to leave without paying their checks. Some exit signs were covered up by the palm trees and draperies. In the end, some 492 people lost their lives and many hundreds more were injured. Tales of heroism and of cowardice—and of narrow escape—came out of the fire. Those who escaped unharmed were very, very lucky, and had something to tell their grandchildren. Many of the injured would never fully recover. Most of the victims were young people in their twenties and thirties; the youngest victim was 15. A couple who had just been married that afternoon perished. Many young soldiers home on leave from the war lost their lives. Many victims died of smoke inhalation and toxic fumes without ever being touched by the flames. The fire ended up being the worst nightclub fire in American history and the second-worst single-building fire. Only the Iroquois Theater fire in Chicago in 1903, which claimed 602 lives, was worse. The Coconut Grove tragedy shocked the nation and led to the reform of fire codes and safety standards throughout the country. The owner of the nightclub, Barney Welansky, was eventually found guilty of involuntary manslaughter because of the many safety violations that were cited. He did a little jail time but was released because he was ill and didn’t have long to live. He was quoted as saying that he wished he had died that night in the fire. For an excellent account of the Coconut Grove fire and its aftermath, read John C. Esposito’s fascinating nonfiction book, Fire in the Grove. I spent 28 years in the fire service. This fire as sad as it was has saved untold numbers of people because of code changes that came from this fire. The photo at the beginning of this article,is NOT of the Coconut Grove Fire. Thanks. I’ll replace it with another picture.